If you add other ingredients, you need to extend the cooking time. The egg cooker cannot be used in microwave ovens. You need to add Non-stick Cooking Spray（cooking oil or coconut oil，but Non-stick Cooking Spray is the best choice） in egg cooker before use for avoiding eggs stuck in the egg cooker. ❤TIP：#1, You need to add Non-stick Cooking Spray（cooking oil or coconut oil，but Non-stick Cooking Spray is the best choice） in egg cooker before use for avoiding eggs stuck in the egg cooker. #2. 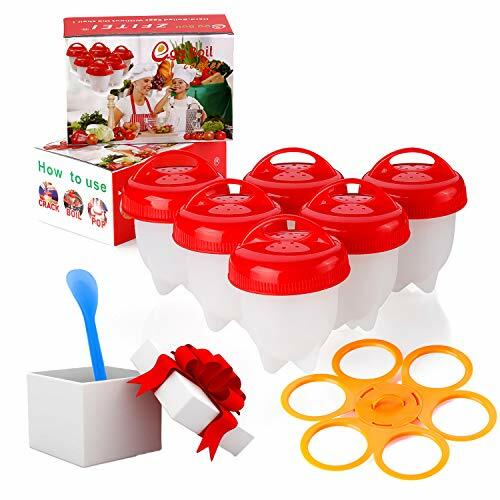 Use our exclusive accessory "EGG COOKER HOLDER" to prevent egg cups from tumbling. #3. (DO NOT USE) THE EGG CUPS IN THE MICROWAVE. ❤DURABLE & SAFE：Temperature safe from -40°F to +248°F(-40℃ to +120℃). These are dishwasher Safe and easy to clean. The egg cooker let's you easily make soft, medium, hard boiled eggs, scrambled eggs, mini omelets, salads and more. If you have any questions about this product by ZFITEI, contact us by completing and submitting the form below. If you are looking for a specif part number, please include it with your message.